Emergency teams scrambled to contain thousands of tonnes of crude oil that spilled into waters near one of the world's busiest ports yesterday after two ships collided in the Singapore Strait. Singapore's Maritime and Port Authority (MPA) said in its latest update that 5,000 tonnes of crude had leaked from the Malaysian-registered tanker MT Bunga Kelana 3, double its estimate just a few hours earlier. A crude oil slick about four kilometres long and one kilometre wide was spotted near the east coast of Singapore hours after the pre-dawn collision, the authority added. The stench of fuel lingered over residential districts near Changi airport into the night as some of the oil evaporated in the stifling tropical heat. The tanker suffered a 10-metre gash on its port side after colliding before dawn with the MV Waily, a bulk carrier registered in St Vincent and the Grenadines, Malaysian maritime officials said. 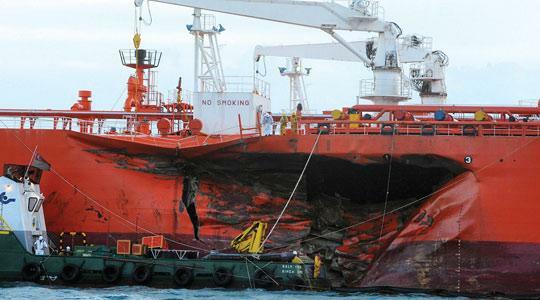 Malaysia's Maritime Enforcement Agency said in a statement that the tanker had been towed to Singapore's Changi port for repairs while the MV Waily was still anchored at the collision site. It said the double-hulled tanker - designed to minimise cargo spillage in case of an accident - was carrying almost 62,000 tonnes of crude. Singapore's MPA said a total of 20 vessels from Singapore and Malaysia were involved in the cleanup effort while 200 personnel were on standby to attend to coastal areas that might be affected by the slick. "Efforts to contain and clean up the oil spill are ongoing," it said, adding that neither the spill nor the emergency response had affected ship movements in the busy commercial route running along the Singapore and Malacca straits. The Malacca Strait is bordered by Singapore, Indonesia and Malaysia. Singapore's Foreign Ministry issued a statement saying the city-state "will continue to render full assistance and cooperation to the Indonesian and Malaysian authorities to contain and clean up the oil spill". Containment booms were being used to confine the oil slick, which was being treated with biodegradable dispersants designed to break the oil down into smaller globules to be collected by response vessels. Singapore marinas, ferry terminals, sea sports centres and other waterfront facilities were told to be prepared for possible effects of the oil spill, although one salvage expert said much of the crude would evaporate. Singapore is one of the world's busiest ports, with data from the MPA showing the island-nation handled 472 million tonnes of cargo last year, with bulk oil cargo constituting 37.5 per cent of the amount. Major oil refineries are also based in Singapore to serve the regional market. The tanker's operators, Malaysia-based AET, said in a statement: "Oil booms are being placed around the leaked cargo to contain the spill."